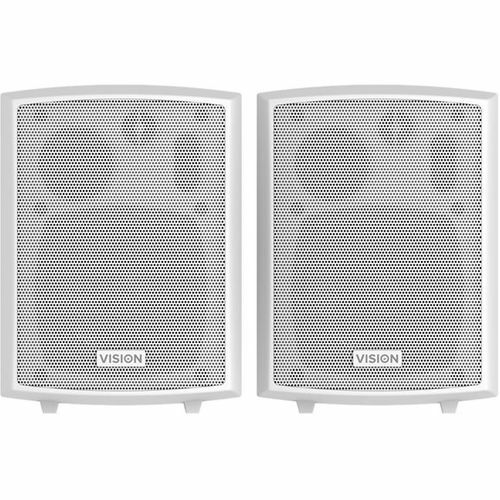 The SP-800P are Visions most cost-effective audio solution. They are purpose-built for small meeting rooms and classrooms. Incredible value for money;they offer great sound quality and Visions trademark ease of installation. Two stereo summed line-level inputs: 1 x 3.5mm minijack input / 1 x 2-phono input. Horizontal C wall brackets included. 3-way with 4" driver. Cables Included: 1 x Speaker cable 5m , 1 x UK Figure-8 power cable 1.8m, 1 x EU Figure-8 power cable 1.8m, 1 x AU Figure-8 power cable 1.8m. Dimensions: 220 tall ? 150 wide x 145 deep (mm). ABS plastic.